The many virtues and pleasures of electric propulsion are well known in river and canal boating circles. Electric motors are virtually noiseless, have no smelly fuel and produce no polluting emissions. In other words, these propulsion units are truly “Green” and environmentally friendly. By making good use of modern developments in electric motor design, VETUS has constructed the ideal electric propulsion unit. This has the principal assets of: very low power consumption, continuously variable speed, low weight and compact dimensions. This VETUS electric propulsion motor does not use carbon brushes, which makes it whisper silent and maintenancefree. At low revolutions, the efficiency of this brushless motor is considerably higher than conventional electric motors equipped with carbon brushes. This VETUS brushless motor also has a very favourable power to weight ratio. Another remarkable feature of the brushless VETUS electric motor is the very low number of revolutions (max. 1,250r.p.m. ), which means that it can be coupled directly to the propeller shaft, without the need for a reduction gearbox. The complete installation is virtually maintenance free and operates virtually without vibration. Finally: the price is extremely competitive and much lower than that of a small diesel engine. In order to enhance its efficiency even further, the electric motor is cooled by means of a keel cooling system. 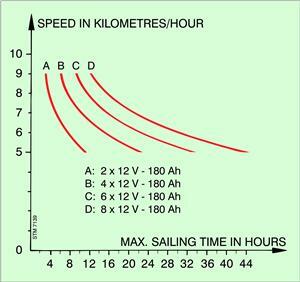 During trials with a 2,2 kW electric motor in a 6 metre GRP launch, with a total displacement of 1,2 tons (4 persons and 4 batteries on board), the power consumption was 50 A (24 Volt) and have a max speed of 9 km/h. (4.8 knots) With the available battery capacity (24 Volt - 360 Ah) it was therefore possible to make a trip of 6 hours at this maximum speed assuming the batteries will accept 80% discharge. If lower speeds are acceptable, the total motoring time will of course be proportionally increased. A few hours of leisurely pottering around and then, at the end of the day, back home with a little more speed. The electric motor, driven by the diesel engine, will then function as a dynamo, charging the batteries for the next round of electric propulsion.